Did you hear that Ron Paul raised over $6 million in one day? He broke the previous record which he had set on November 5! 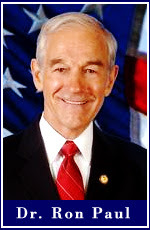 If you don't know much about Ron Paul check him out here. My husband and I are proud supporters. Come join us in supporting a man with impeccable character (30 years of voting records in Congress will prove that) and one who is a true defender of the Constitution.